In your data center you have all the proper planning in place to account for emergencies like a power failure, with a backup uninterruptible power supply (UPS) system to ensure that your mission-critical systems are always running—but is your system ready? If you are not performing regular UPS maintenance, especially on the battery, it may not be ready to go when you need it. Here are a few things you should be doing on a consistent basis to ensure that your UPS system, especially the battery, is ready to power your vital systems when the power goes out. First, when you install the system, make sure that the UPS can maintain constant contact with the electrical ground. As you are performing your regular UPS maintenance, double-check to see that this is always the case. In addition, it’s important not to overload the UPS, and if you see potential problems during your routine maintenance, remove it from your system until you can repair or replace it. These small steps can save you a lot of trouble down the road. Inside the UPS there is a battery, which is the most likely part of the system to fail, and in the long-term you will likely need to replace the battery to keep your system running. The system will come equipped with a battery sensor that should alert you when the battery is degrading, but if the sensors are not properly working, the battery can easily fail without you even knowing it. In that case, you won’t find out that you need a new battery until you need the UPS and it’s not working. To prevent this from happening, part of your UPS maintenance plan should include testing the battery sensors at regular intervals. Doing this approximately every six months should be sufficient. Some of the things that will drain your UPS battery more quickly include exposure to extreme hot or cold temperatures or high humidity, and frequent power outages that tax the UPS. While there is not much you can do about the latter, to prevent the former, your UPS maintenance plan should include regular inspection of the data center facilities to ensure that the environment is optimal for your system. When you do have to replace your battery, it is important to recalibrate the entire system, including the battery sensors and the dwell-time calibration. The process for recalibration will differ depending on your software, but it’s an important step to remember when you install a new battery. If you are not sure you can perform these types of checks on your own, you may want to consider purchasing a UPS that includes a service contract. 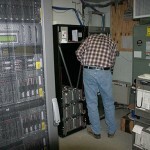 If you have a low-end unit, the cost of a service contract may outweigh the cost of simply replacing your entire unit if something goes wrong, but for extensive data centers that require multiple high-end UPS systems, service contracts can be beneficial, especially if the alternative is significant downtime following unit failure, while you are trying to get it back up. The wrong time to realize that your UPS is not running properly is when you need the backup power supply. Instead of being left with downtime and lost productivity, be sure you have a proper UPS maintenance plan for your center. This entry was posted in Uninterruptible Power Supply, UPS Maintenance and tagged UPS maintenance. Bookmark the permalink.